Seattle Weekly's owner, Everett-based Sound Publishing, confirmed that the once-influential newsweekly would go web-only this week, after 42 years in print. 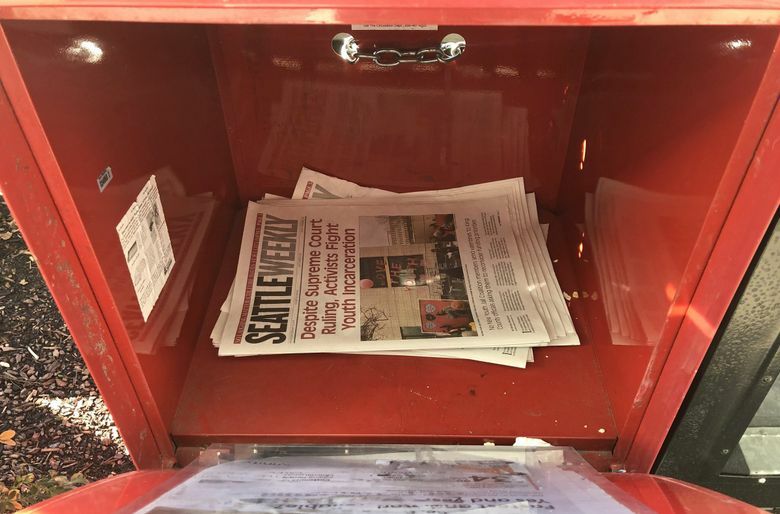 Seattle Weekly, once one of the most innovative and influential voices in Seattle arts and politics, and a leading light of the alternative weekly movement, will no longer be seen on Seattle’s streets after this week. The decision to kill the print edition, first reported in Crosscut, marks the latest effort to keep the Weekly alive in a publishing environment that has been completely upended by digital competitors. In 2017, Sound Publishing tried to revive the struggling publication by merging the Weekly’s operations with the company’s large network of community newspapers — a move that involved cutting the staff of roughly two dozen to just three. “But the relaunch did not attract enough of an audience and advertising base to make the print product successful,” O’Connor acknowledged. O’Connor insisted that the Weekly “will move forward as a digital-only product” with a mix of content from freelancers, the Weekly’s archive, and from Sound Publishing’s large network of regional publications, which include The (Everett) Daily Herald, the North Kitsap Herald and the Bellevue Reporter. But Seattle newspaper insiders say the web-only model effectively marks the end of one of Seattle’s most inventive publications. Few in the Seattle newspaper world were surprised by this week’s news. Seattle Weekly has struggled since the early 2000s, when the relentless growth of digital advertising platforms like Craigslist began cutting deeply into the paper’s revenue and led to several rounds of layoffs under a succession of new owners. Still, Brewster, who has since gone on to found Crosscut, Town Hall Seattle and the Folio library, among others, said the Weekly’s rapidly shrinking profile runs counter to Seattle’s image as “such an ‘alt-weekly’ town,” with a wealthy, highly educated population and an appetite for media experimentation. Indeed, Seattle Weekly was conceived as a then-radical journalistic hybrid — a literate newsweekly that covered the gamut of city affairs, from politics to the arts, but which also overtly promoted Seattle’s cultural and economic growth. “The Weekly was always very interested in city building — in making a better city, making a more sophisticated city,” Berger said. Inspired by writerly, arts-oriented magazines like The New Yorker, The Atlantic and the New Republic, the Weekly gradually built a staff by offering freelancers a chance to develop their writing chops. The hybrid model paid off handsomely. By the mid-1990s, Seattle Weekly routinely published editions of 100 pages or more. One “Best of Seattle” edition came in at more than 200 pages. Its parent company, Sasquatch Publishing, published a series of books and, in 1990, launched a free paper, Eastsideweek, to cover news east of Lake Washington. By 1997, when the paper was bought by Stern Media, owners of the Village Voice, combined circulation exceeded 100,000. But the good times couldn’t last. In the early 2000s, Craigslist and other digital platforms were carving off huge pieces of the alt-weekly market. As revenues fell, the Weekly and other papers fell into a “vicious cycle” of layoffs, declining content quality, worsening revenue and more layoffs. Help seemed to arrive in 2013, when the Weekly was purchased by Sound Publishing, a regional publishing powerhouse with dozens of publications and deep pockets. But from the start, industry insiders worried that the Weekly wasn’t compatible with Sound Publishing’s “community newspaper” model. Sound Publishing and its Surrey, B.C.-based parent, Black Press Media, specialize in “keeping costs down and consolidating services,” said Brewster. Their strategy, Brewster said, is to buy up community newspapers “and then reduce the editorial staff to one or two.” The companies have “no experience with alternative weeklies,” Brewster added. Berger agrees. “Sound Publishing is oriented toward a kind of community paper that the weekly was never designed to be,” he said. Such skepticism seemed justified by heavy layoffs in 2017, which reduced the editorial staff to two writers and an editor and was further confirmed by this week’s news. “The only remaining staff will include a web producer, part time social media position and a multimedia sales consultant,” O’Connor said in an email. Still, few in the Seattle media world were putting the blame entirely on Sound Publishing. The city’s newspaper sector has been decimated by layoffs and closures as the traditional revenue models run aground in the new digital world. Despite the bad news for the Weekly, advocates of alternative journalism point to numerous success stories in Seattle, among them, the persistence of The Stranger, the rise of online sites like Crosscut and the crowdfunded success of KNKX. Even Brewster remains optimistic. Editor’s note: Seattle Times reporter Paul Roberts worked for Seattle Weekly from 1988-94. Correction: Seattle Weekly was sold to Stern Media in 1997, not 1995, as an earlier version of this story stated.